But lets get through the recipe, as it would be simple writing it in Italian, but in a foreign language, you know… I will take it step by step. 6 days before you intend TO EAT your macarons, take out of the fridge 2 eggs, divide white and yolk (use the latter for something else) and leave whites at room temperature, in a glass or some other kind of jar, covered with plastic film. The whites MUST weight 73 g.
Sieve together sugar, almond flour and cocoa. Whip the egg whites until they are stiff. Add all in once the sieved mixture and begin to mix everything with a spatula, from the centre of the bowl to the borders, turning the bowl at the same time (I know it sounds strange, but it works). You will end up with a gluey mixture, a bit fall down compared to the stiff whites. That’s perfect, don’t worry. Transfer your mixture into a pastry bag with a smooth decorating tube of 8 mm of diameter and begin to make your macarons on a baking sheets covered with greaseproof paper. You will obtain approximately 35-40 macarons. Let them rest at room temperature for at least 30 minutes (better 1 hour). Pre-heat the oven at 250° C. Once is hot enough, place your baking sheet over another baking sheet, turn the temperature to 180° C and bake you macarons for 10-12 minutes, NEVER opening the oven door. Melt all the ingredients, except the Cointreau. add the alcohol only in the melted ingredients. let the mixture to cool before to fill the macarons. Let the macarons rest for at least 36 hours in the fridge before to consume them. Dedicated to The Girl Who Ate Everything and to all macarons lovers around the world… In two day I probably publish a pic of the inside… If I can resist! Of course this recipe is from Secret Gourmands, by Pierre Hermé. Wait, you have to leave the egg whites out of the fridge for 6 days? Don’t they go bad or something? Anonimo 2: first of all, you leave them for 4 days, and they do not go bad: the salmonella bacterium is present in the yolks, but not in the whites. I have not had macaron making success, but yours make me want to give it another try! I love making macarons and after making ice cream, I have now a batch ready to try this recipe, which is way easier than mine. I’m honored! :] I was looking at your post with a friend while saying that I’ve never made macarons…and they look so challenging…but of course you can do it because you KNOW HOW TO COOK STUFF! 😉 Your macarons look so beautiful. Mraaah! 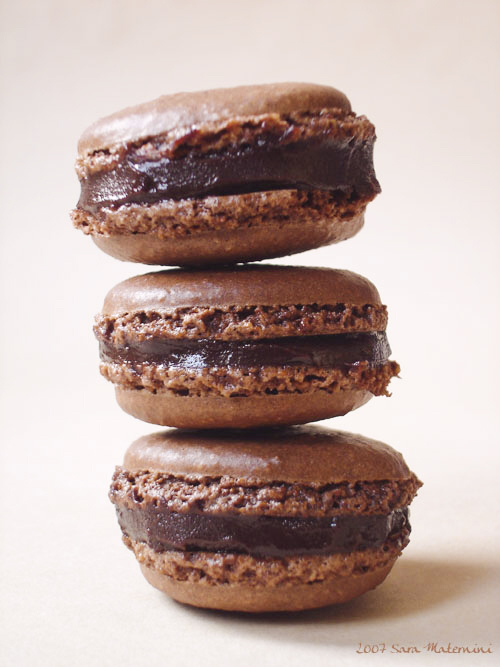 i’m not a huge fan of macarons.. but i have to admit that yours are so gorgeous and above all are made with my 2 magic words: chocolate+cointreau, an orange liquor soooooooo good when associated with chocolate!! ti sono venuti benissimo!! grazie per la ricetta! Yum yum.. These macarons really makes me feel hungry..
Do the amount of sugar affect the quailty? 160g sugar(do you mean icing sugar? )this is abit too sweet for me.. I normally uses 80g to 100g of sugar. @Eileen: absolutely it does effect! Do not change proportion, or you will end up with something different! You can work on the filling if you want something less sweet, but not on the macaron proportion: patisserie is a precise science, after all! Bt the way, have you try making buttercream filling for macarons? Anyway I should work out the shell first.. That will be my 10th tries! 🙁 I am a poor baker..
absolutely love yr macaroons . Will try to bake then soon but i do not understand this verse- Pre-heat the oven at 250° C. Once is hot enough, place your baking sheet over another baking sheet.How do i place one sheet over another. Will you be trying the coloured macs such as yellow or the pink ones. Yuum cointreau sounds devilish with chocs. PH does have great recipes, I just got his Macaron book, was sold out last year, but ohhh im am having a ball following his recipes. Great post!